The CBS Sports Classic, which features Ohio State-UCLA and Kentucky-North Carolina is one of several marquee events worth watching this weekend. College students around the country are getting ready to plow through exams and head home for winter break. College football is in its pre-Bowl season lull. Good thing college hoops is here to save your weekend with a fascinating and festive slate of games. The highlight is the clash of bluebloods at the CBS Sports Classic in Las Vegas, but we will also be treated to an old-school used-to-be Big East battle between Georgetown and Syracuse, as well as a matchup of Wake Forest and Xavier played in honor of the late Skip Prosser. Sean Miller has done an amazing job keeping the Wildcats together using bubble gum and duct tape despite a rash of injuries, but winning this game in a semi-road environment does not seem likely. Texas A&M played UCLA real tough in Anaheim, and just like Arizona has with Lauri Markkanen, the Aggies have their own precocious freshman big man in Robert Williams. The Hoyas were reeling in the early going, losing four of their first six, but they have stabilized with four straight wins over weak competition. Alas, this team really depends on getting to the foul line, and that will be hard to do against the Orange’s zone (especially with the Cuse benefiting from a little home cooking from the refs). Jim Boeheim may have found a pair of sparks for his flagging offense in grad transfer John Gillon and freshman forward Taurean Thompson, who combined for 45 points off the bench in their most recent win over Boston University. Memphis’s spotty point guard play was problematic down the stretch of the Tigers’ home loss to Monmouth on Tuesday. The Sooners will have a decided advantage at that position with senior Jordan Woodard. And while Memphis 6' 9" sophomore forward Dedric Lawson has played well (20.4 ppg, 11.1 rpg, 3.7 apg), he is going up against a top-notch post defender in rim protector in Khadeem Lattin, a 6' 9" junior who ranks third in the Big 12 in blocks (2.33 per game). The Irish looked real good while hanging with Villanova last weekend, but unlike the Wildcats, Purdue has two quality big men to take advantage of Notre Dame’s lack of size up front. On the flip side, it’s going to be real challenging for those Purdue bigs to defend a team that stations five players behind the three-point line. I'll give the edge to the Boilermakers because they will be one of the few teams Notre Dame will face all season that is even more proficient from behind the arc than the Irish. The Buckeyes are still in that two-steps-forward-one-step-back mode. They almost knocked off Virginia in Charlottesville on Nov. 30, but then they lost at home in overtime to Florida Atlantic in a game in which they shot 4 for 20 from three-point range. They’re not a bad defensive team, but like every other team in America the Buckeyes will have a hard time matching the UCLonzos bucket for bucket. Don’t you just wish this game were being played in an old high school fieldhouse somewhere? 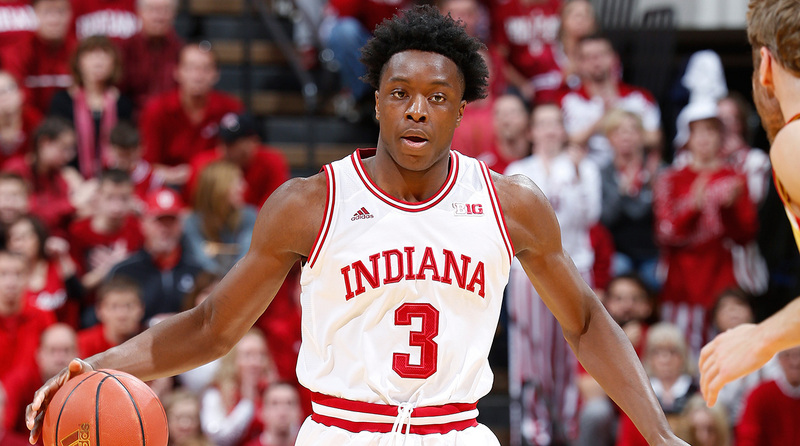 The good news for the Hoosiers is that 6' 8" sophomore forward OG Anunoby will return following a three-game absence due to an ankle injury. That’s bad news for Butler’s leading scorer, 6' 7" junior forward Kelan Martin, because Anunoby is one of the best wing defenders in the country. The word is that North Carolina hopes to have the services of junior point guard Joel Berry, who has missed the last two games because of a sprained left ankle. Berry is the difference between a likely Tar Heels win and likely Tar Heels loss. Kentucky depends heavily on its ability to overwhelm opponents with pace and athleticism. The Heels can match UK in those departments, but they will bring far more experience. They will also have the best player on the floor in 6' 8" junior forward Justin Jackson. This is a huge game for Northwestern’s NCAA tournament chances. The Wildcats survived a scare at home against Chicago State on Wednesday night, and it won’t be easy knocking off the Flyers without 6' 8" sophomore forward Dererk Pardon, who has a hand injury and is not expected to return until early January. Dayton only lost by four at home to a good Saint Mary’s team on Nov. 19, but it also lost to a not-so-good Nebraska team at the Wooden Legacy in California on Nov. 24. So it’s basically a coin flip, and I'm guessing will come up purple. We all know the Shockers lost their star-studded backcourt tandem, yet here they are, ranked fourth in the country in defensive efficiency and riding a four-game win streak that includes a win over Oklahoma in Oklahoma City. Wichita State also leads the country in bench minutes, so you know they have balance and depth, and therefore more margin for error. I think Wichita State's ability to swarm and lock up scorers will make things too difficult for Jawun Evans and company. I love that these two teams play every year to honor Skip Prosser, who coached at both schools (Xavier from 1994 to 2001, and Wake Forest from ‘01–07) and passed away unexpectedly nine years ago. Wake Forest is improved over last season, thanks in large part to 6' 10" sophomore forward John Collins, who ranks seventh in the ACC in scoring (18.0 ppg), third in rebounding (10.7) and sixth in blocks (1.7). Still, the Deacs just don’t have the horses to win a game against a tough, veteran Xavier team on its home floor.